CASEE is built on a foundation of authentic research and connections with industry professionals. Students travel to Mount St. Helens to conduct authentic research. CASEE 10th grade Environmental Science students travel to Mount St Helens to conduct ecological field studies in several locations across the monument. 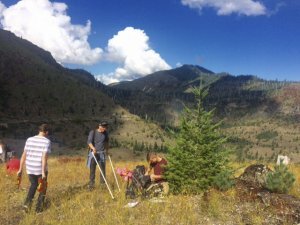 Student take the data back to the classroom to analyze differences in how the environment has recovered from the eruption across different disturbance zones and land management strategies. The projects ends with a research conference at Washington State University’s Vancouver campus in which schools from all across southwest Washington gather to compare their research. 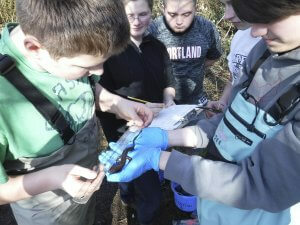 CASEE students join citizen scientist from around the county to help determine the health of our native amphibians. Freshman at CASEE join volunteers from around Clark County to search for amphibian egg masses in wetlands at the CASEE campus as well as wetland restoration sites in Brush Prairie. Amphibians are an important indicator of watershed quality and the stationary nature of the egg mass makes them easy to tally than their adult counterparts. Student data is shared with SWAMP coordinators and Clark County Environmental Services to help determine the success of restoration projects and influence future work. Students work together to collect data on CASEE’s amphibian populations. 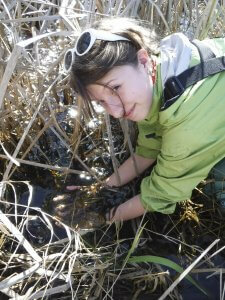 US Forest Service researcher Charlie Crisafulli has helped CASEE staff develop a 14 year long amphibian population study. Students trap and mark adult and juvenile salamanders to estimate the population size at CASEE and analyze how it has changed over time.